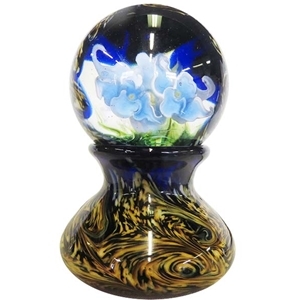 MoonMarble.com - David Salazar - Large "Van Gogh Floral Marble with Base"
Art Glass → Contemporary Handmade Marbles → David Salazar - Large "Van Gogh Floral Marble with Base"
This flower marble is a beautiful example of David Salazar's painterly technique. It depicts a bouquet of blue violets in a frame of a swirly design reminiscent of Van Gogh's Starry Night Sky. Sits on a matching base. This marble measures 2 ½” shy in diameter. The vase like base is 2 5/8” wide x 1 7/8” tall. Marble and base is 4” tall overall. Signed and dated by the artist.